Ever since the Cycle broke down 2 weeks ago we’ve known that lower prices were ahead. Some say the Cycles are not as affective these days, but I say the Feb 11th Cycle (failure) warning saved many, allowing them to side step the worse of it. What we have now is quite simply a collapse that should mark an Investor Cycle Low, and with it the much anticipated B-Wave Low. Every single condition that I track is deeply confirming an Investor Cycle Low is ready to form. Unless this is a 2008 like crash, then gold either formed a Cycle Low today or will likely complete that process tomorrow. 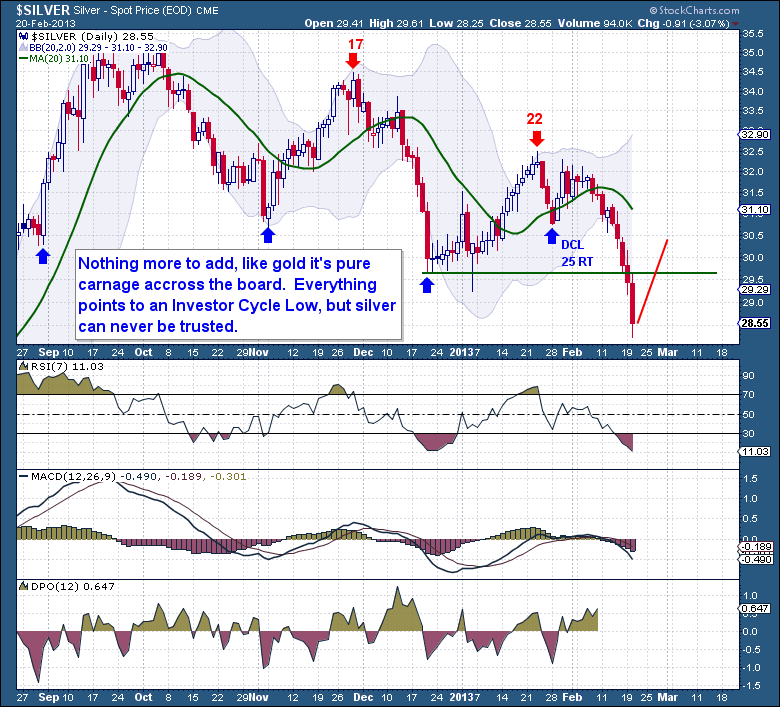 Silver has given way too, and although not as much as gold, it too looks as if an Investor Cycle Low is at hand. The problem with Silver in this type of environment is that even one day makes a huge difference. I pointed out last week that you never want to hold Silver into an ICL event because Silver can and often will collapse much deeper than anybody can handle. The same principle applies in buying Silver, it’s very difficult to safely time an ICL and the risk hardly justifies it. 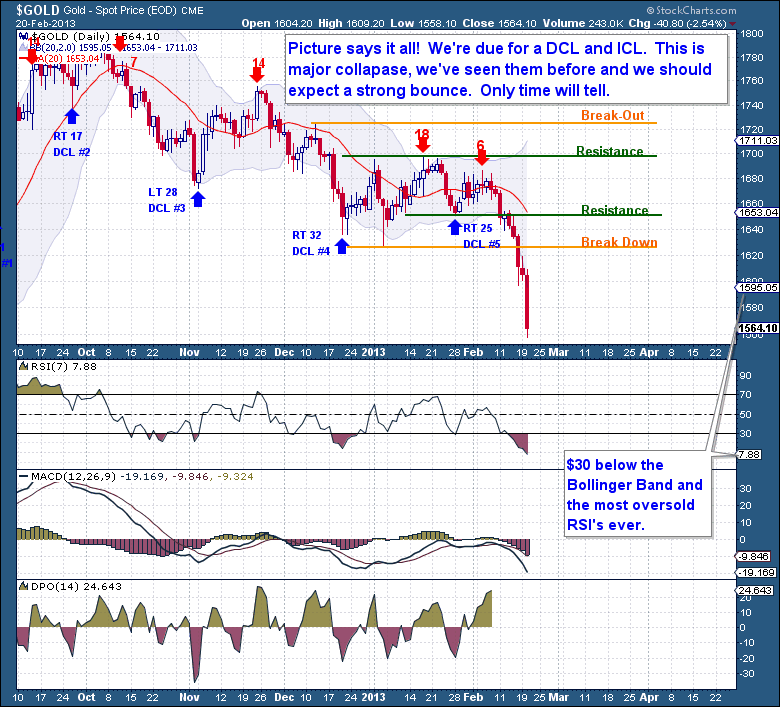 Take a look at Silver’s 3 past ICL drops over the last 2 years as an example. I keep hearing that the miner might crash. Let me tell you, today was the largest volume day ever in GDX’s 7 year history. The entire candle sits outside of the Bollinger Band and $1.40 below it. It has lost 22% in just 20 trading sessions and 47% since September. Sentiment and RSI are at their lowest levels ever. That is the definition of a crash! 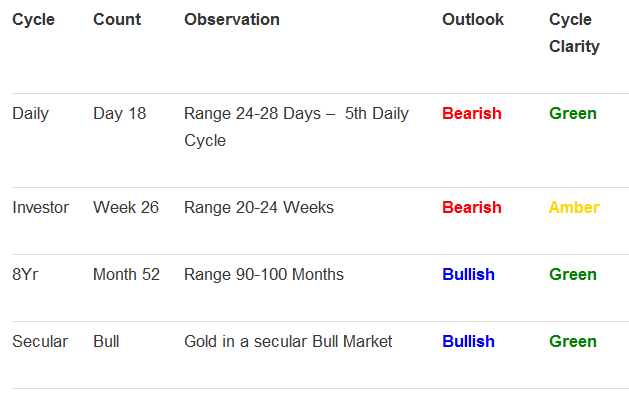 This is an excerpt from this midweek’s premium update published on Wednesday (2.20) focusing on the Precious Metals from the The Financial Tap, which is dedicated to helping people learn to grow into successful investors by providing cycle research on multiple markets delivered twice weekly, as well as real time trade alerts to profit from market inefficiencies. They offer a FREE 15-day trial where you’ll receive complete access to the entire site. Coupon code (ZEN) saves you 15%.